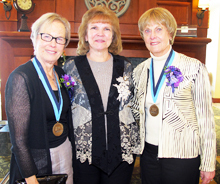 The College of Education community recognized two members of our extended community this spring at a luncheon honoring this year's recipients of the Distinguished Alumni and Distinguished Former Faculty Awards. When young Charlotte Hearne accepted a part-time job working for Dean of Women Luella Galliver shortly after graduating from Laramie High School, she had no idea that most of her 40-year education career would be spent serving students from essentially that same office. What was clear at the time was that she and her six siblings would go to college, thanks to the commitment of her parents. Charlotte enrolled in UW’s secretarial science program in the fall of 1957. “If you wanted to be in business, you started as a secretary,” she says. “Major business positions weren’t open to women. Charlotte had no plans to teach, but her father insisted that also take the courses needed to certify. Dad was right: her first job after graduating from UW in 1960 was teaching at Glendora High School in southern California. “I loved the teaching and thought ‘this is what I should be doing,” she says. But Charlotte quickly learned that she needed to expand her skill set to address her students’ needs. Ultimately, she chose the UW College of Education and its master’s program in guidance and counseling. Charlotte took classes in Laramie during the summers and returned to California each school year to teach in 1964. After completing her MA in 1966, Charlotte assumed new responsibilities at GHS: counselor and director of student activities. But the call to return to Laramie in 1966 was strong. 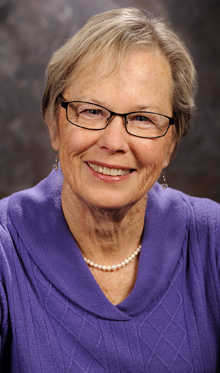 Dean of Women Margaret “Peg” Tobin hired Charlotte sight unseen to serve as her assistant. She also married Maron Davis (BS ’65, secondary biology education, MS ’67, natural science) that year. Davis dedicated 34 years of her career to serving generations of UW students, and she spent many of those years working side by side with friend and mentor Tobin. Part of their responsibility was enforcing an evolving set of university rules and regulations. “The constant shifting of ways of doing things and understanding the current environment and culture and providing what was needed at the time” was a challenge early in Davis’ career. She witnessed – and helped to implement - movement away from strict enforcement of policies dictating women students’ behavior (for example, dorm visitation hours and clothing restrictions that prohibited wearing pants) to a more open campus. She served on a range of campus work groups and committees over the years, sharing her expertise to enhance the quality of life and services available to UW students. The other component of her job was far more enjoyable: advising virtually all of UW’s honorary societies and mentoring its student leaders. Charlotte advised Panhellenic Council, Spurs and Chimes. She advised UW’s Mortar Board chapter from 1966-2003 and the Associated Students of UW (ASUW) student government for 22 years. She served her sorority, Delta Delta Delta, in a variety of advisory roles. She also chaired the first UW Minority Student Leadership Initiative. Every night during the school year meant one more student organization meeting or event to attend, a schedule that would have exhausted anyone else. 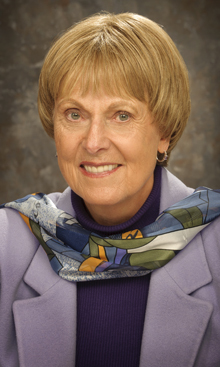 Later in her tenure at UW, Charlotte launched and advised Freshman Senate. She also developed a cornucopia of programs designed to enhance the new student experience and set them on the path to college success. “I had to think through each aspect of the things that we knew about retention,” she says, and come up with programs and resources to meeting the core needs of freshman students. Two scholarship funds honor Davis: The Charlotte H. Davis Scholarship and the Charlotte H. Davis Leadership Fund. Charlotte’s commitment to women’s leadership development extends beyond the campus boundaries. Among her many service commitments: membership and leadership roles in Zonta International, leadership roles in both the Colorado-Wyoming Association of Women in Education (CWAWE) and the National Association of Women in Education (NAWE) and president of PEO Chapter U.
Charlotte was ready to roll up her sleeves and help wherever she is needed in retirement. For the past five years, she has been part of the Andros Dental Project, volunteering with husband Maron and Laramie hygienist Chris Walrath to provide dental hygiene education and services to children on Andros Island in the Bahamas. The children – and their teachers and parents – look forward to their annual visit and have made significant life changes in the spirit of protecting their dental health. Charlotte also serves on the College of Education Advisory Board, which she joined with Maron. “It’s been great to learn about what’s going on in the college – the things that are happening that are really exciting,” she says of that volunteer opportunity. Child development as a career path seemed like an obvious choice to Peggy when she graduated from high school. The second of seven children, she not only had plenty of practice caring for young children, she had a reputation for doing it well. Majoring in child development made perfect sense as did attending hometown Cornell University, where she would learn from world-renowned scholars. Peggy knew that a child development career would require graduate work, but she postponed that in order to explore the region of Central America. A Cornell placement officer suggested a one-year teaching assignment in Guatemala and Peggy applied. She accepted the job teaching Kindergarten at the American School, and set off for an adventure that would not only clarify her professional direction but provide a theme for the rest of her career. Peggy didn’t speak Spanish when she arrived in Guatemala in 1964, but school administrators weren’t concerned. The kindergartners learned English, while their young teacher absorbed their native language. That wasn’t the only transformation that was taking place in her classroom. Reflecting on her year abroad, she says, “I learned that teaching was the career that I wanted. There was no question.” The desire to teach wasn’t the only take away from her Guatemala experience. She had a chance to better understand an indigenous culture where deep poverty impacts a large percentage of the population. It was the first of several experiences that shaped her approach to teaching and her eventual research agenda. Peggy returned to the U.S. and completed a master’s degree in Curriculum and Instruction, with an elementary teaching certificate, at the University of Wisconsin-Madison. Peggy taught at schools in Wisconsin, California and New York. She moved to Laramie with her two young sons and husband David, who joined the College of Engineering faculty. Preferring preschool programs, she accepted a teaching position at the Laramie Cooperative Preschool. Her response to an important question – What would you do differently? – made an impression on the parent run board. They hired Peggy and helped her implement the learning center approach that she recommended in her job interview. The change was a success with students, parents and teachers. Peggy left the Child Care Center in 1991 to pursue a doctorate in Curriculum and Instruction at UW. Burning questions about best practices in early childhood education, and the chance to research the role of play in early education, fueled this next phase of her professional life. Following graduation in 1994, Peggy accepted a tenure track position in the College of Education. The challenge was substantial as after one year she became the only early childhood faculty member. Peggy regularly taught 12 credit hours per semester in addition to launching her research agenda. In 1997, Michelle Buchanan was hired and the early childhood program gained momentum. Support from the college administration and funding from external sources, including the Daniels Fund and the John P. “Jack” Ellbogen Foundation, facilitated program growth that met the ever-increasing need to serve undergraduate and graduate students statewide. The Interdisciplinary Early childhood Education endorsement and the Early Childhood Special Education certification were established as distance delivery programs. Peggy returned to Guatemala in 2003 for her sabbatical year. She taught at the Universidad del Valle de Guatemala while studying perceptions of children’s play in two local schools. Her research took a mixed-methods approach: surveying parents and teachers and observing children in their school settings. Peggy’s legacy includes an initiative that invites in-depth study around issues of social justice. Peggy and former education faculty member Omowale Akintunde co-founded the Symposium for the Eradication of Social Inequality, now known as the Shepard Symposium on Social Justice. Originally established as a college-level learning opportunity for education majors, the annual event has evolved into a National Symposium addressing the inequalities embedded in society around race, class, and gender. As shown in this description, Peggy has strong beliefs. In her words, “It’s very important that when a contribution is made, if it’s worthy, it becomes institutionalized so it’s not associated with a person. It belongs to people who are involved in it now.” This belief toward enduring contributions applies to the Shepherd Symposium, the UW early childhood online programs, the campus programs and the Early Care & Education Center, as well as the initiatives taken to integrate diversity and play into these programs. The importance of all contributions is for those who use them now.